2.3 One-Piece Toilet or Two-Piece Toilet? 2.4 Which Is The Best Toilet Brand? 2.5 Is The Warranty Important? When it comes to choosing a toilet, there are some great options to choose from as the industry keeps growing. We have some great options on our list for you to choose from, so take the time to read our buying guide and toilet reviews. Manufacturers have been concentrating on making the toilets more compact while still retaining seat space and comfort. A combination of these key features has been most beneficial for the growth of the industry. Of the many brands on the list, Toto and Woodbridge are the two brands that stands out the most; although we’re not discounting any of the other brands. Note that our top pick on the list as the best toilet to buy in 2019 is from Woodbridge, so take away from that what you will. Toto accomplished so much with the Neorest that a lot of other companies such as Saniflo have starting following their lead. Not everyone is ready for these up-to-date toilets, though, so the biggest change you’re likely to see in your neighbor’s home is an upgrade from a 2-piece to a 1-piece unit. Tankless designs are still finding their footing, aided somewhat by hesitant curiosity, but you shouldn’t expect that fear to last for too long as these models are the future of toilets. In fact, some customers are already spreading the word about how great tankless designs are. The low-maintenance aspect serves you well, and if you have a half bathroom, the extra space will be more than worth the trouble. We’re also constantly reviewing the best flushing toilet which are always a popular option to go for. The Woodbridge T-0001 is a smart choice for anyone looking toamalgamate quality and functionality in one stylish product. This high-efficiency model only uses 1.28 gallons per flush, yet manages to make flushing powerful and quiet. The Swiss Madison St. Tropez one-piece offers a sleek and seamless design that makes it a choice toilet for a powder or guest bathroom. A WaterSense certified toilet, the Woodbridge T-0033 has a soft-closing seat making it safe for children and the elderly. Green users will be impressed that it only uses 1 gallon per flush, which is incredible considering it gets rid of all waste in 1 flush. The Woodbridge one-piece dual flush toilet is a toilet that combines luxury and simplicity in one. With a clean and sleek finish, the Woodbridge dual flush elongated one-piece offers a powerful flushing system that can remove waste easily and simply. Designed with a siphon flushing system and a glazed bowl that prevents sticking, the Woodbridge T-0001 consumes between 1 and 1.6 gallons per flush making it a WaterSense certified toilet. Designed with a stainless-steel nozzle, the Woodbridge T-0001 dual flush comes in an all-in-one package with a pre-installed toilet seat, wax ring and floor bolts. Made with ceramic, the Woodbridge one-piece comes in 8 different varieties. As a comfort height toilet, this is ideal as an accessible toilet or for those who want a toilet that makes sitting and standing secure and strain-free for all heights. A soft closing lid adds to its functionality and is an added safety feature for children. The dual-flush design means that users can save water based on solid or liquid. For consumers looking for style and simplicity, the Woodbridge T-0001 is an easy install toilet that means one can do it themselves rather than have it professionally installed and at a mid-price range, this model offershigh-end appeal with a budget-friendly price tag. The Woodbridge T-0001 is a smart choice for anyone looking toamalgamate quality and functionality in one stylish product. For the winner as the best toilet to buy in 2019 we choose the TOTO Ultramax II a high efficiency toilet with water sense and the powerful TOTO Tornado Flush system. For the price this toilet is a great option from a trusted brand. The multiple colour choices of the high-priced Toto Ultramax 2 isn’t the only thing this Toto product has going for it. Available colors are bone, colonial white, cotton, cotton white, and Sedona beige. Unique to this model, which is the only product on this list to offer it, is the cotton white 2-pack. Consumers can save money purchasing the 2-pack rather than buy them separately. This is ideal for customers who have a need for multiple toilets, or for customers who need a toilet in more than one home. This high-efficiency model only uses 1.28 gallons per flush, yet manages to make flushing powerful and quiet. You can have confidence knowing that every time you flush, it won’t rock the walls. Toto used a universal height to make this model perfect for users of all sizes, giving them the most comfortable seating ever on a toilet. The elongated bowl uses double-cyclone flushing technology and combines it with SanaGloss so that no matter how much waste is in the bowl, it is fully cleaned each and every time. SanaGloss technology is smooth and one of the prettiest finishes to look at, while still being ultra-functional. The toilet weighs 99 pounds and measures 28.375 × 16.5 × 28.75 inches. Enjoy the 1-year limited warranty and feel safe knowing that Toto supports the Ultramax line very well. Its first product on the list shows that Toto are a force to be reckoned with and that the Ultramax line is very respectable. The Swiss Madison St. Tropez one-piece offers a sleek and seamless design that makes it a choice toilet for a powder or guest bathroom. Designed with a powerful dual-flush system, this model consumes less than a gallon of water on a half flush while a full flush uses 1.28 gallons – this makes it a WaterSense toilet. It’s powerful flushing system also makes it a high-efficient toilet (HET) which is a rating given to toilets that are designed to use as little water as possible. Made of porcelain, the St. Tropez is sleek and seamless design provides an easy to clean exterior. Its elongated seat is comfortable for the elderly and for those seeking to create the illusion and feel of space, it’s narrowness can add and enhance the space in a power or bathroom. Swiss Madison’s St. Tropez comfort height one-piece is a toilet model and design that will provide quality at a mid-range price. It’s powerful flushing system, sleek and easy to clean look makes it a toilet one can depend on for both functionality and performance. The third highest and most commonly sold toilet on Amazon is the Woodbridge Deluxe dual-flush one-piece. Designed with a white vitreous ceramic and an elongated bowl, this model offers a 2” fully glazed trap way. This toilet offers a unique aesthetic appeal that makes it suitable in both a commercial and residential setting. As a dual-flush toilet, the Woodbridge lever is located on the top of tank and consumes 1 to 1.6 gallons per flush. Created with a powerful siphon flushing system, this toilet means no clogs, no sticking at minimal sounds. A WaterSense certified toilet, the Woodbridge T-0033 has a soft-closing seat making it safe for children and the elderly. The bowl, which is elongated also offers that extra added comfort, paired with its comfort height feature, this makes it easy for those who have mobile impairments or struggle with the sitting and standing to do so with ease. For consumers looking for a budget-friendly toilet solution, the Woodbridge T-0033 and the brand is one that offers toilet solutions and a warranty to back their products showing their dedication to the products. Toto shows up again on the list with the medium-priced and under-appreciated Drake model. With a contemporary high-profile design, this 2-piece toilet is still in style in a lot of households due to its durability. Your toilet bowl is cleaned with every flush, thanks to the superior SanaGloss technology that gives the product a smooth ion barrier that shines even after years of use. The bowl gets cleaned every time you flush, more so than with an average toilet. This means less cleaning for you and more time spent enjoying your new purchase. If you prefer when waste gets flushed quickly, you’ll like this one. The Drake is very fast due to the combination of the 2-inch flush valve and the G-max flushing system. G-max is the key to this toilet’s biggest feature, and consumers will love how quietly and quickly it gets rid of whatever is in the toilet, and all while cleaning it. This is a commercial grade flush that has been used with a lot of other appliances. Toto also spent extra time on the 2.125-inch trapway to ensure that this toilet offers an experience worth its price. It weighs 103 pounds and the product dimensions are 28 × 19.5 × 28.5 inches to make the overall size comfortable for most users. There are some interesting features in the Drake that will make it appealing to customers that want a great toilet but don’t want to break the bank. Next is the high-priced Saniflo, which is a bit cheaper than other designs but has impressive features. Like some other items on this list, it is a tankless design that can fit in smaller-than-average bathrooms without seeming cramped. It has vertical pumping up to 9 feet and horizontally up to 100 feet, allowing for a sink connection. Using this model with a well-situated sink in the correct setup will give you the most space possible. Green users will be impressed that it only uses 1 gallon per flush, which is incredible considering it gets rid of all waste in 1 flush. And Saniflo didn’t cheap out on the design; it is stylish all over, and even includes chrome hinges. This small toilet only weighs 62.2 pounds and measures 18.2 × 14.5 × 15.8 inches, but is comfortable for all sized adults and children. It is pure porcelain and it looks the part even after extended use in a full family environment. Electric toilets like these are really the way forward, and with Saniflo introducing a model that is vastly cheaper than Toto’s, it’s pretty attainable for a lot of consumers. The Sanicompact may not have all of the features of the Neorest, but it is still easily among the top 5 on this list of best toilets. Read our Saniflo toilet buying guide here. Moving up in price from Saniflo’s Sanicompact you’ll find the Neorest 700H, which offers Toto eWater+ technology. This built-in feature uses the incoming water supply to mist the interior surface before waste can adhere to it. After each flush, the system similarly mists the bowl to help keep it cleaner for longer. This adds to the unit’s eco-friendliness in that not only does it use minimal water to efficiently flush, but it requires fewer harsh chemicals to clean. While only available in cotton white, the 700H offers luxurious conveniences such as a temperature-controlled heated seat, hands-free automatic flush, and a remote control. The compact design of this unit places its seat at the ideal height for a person to comfortably sit and rise from the seated position. Additionally, the Neorest 700H combines water siphoned from its reserve tank with your home’s water supply to achieve its highly efficient but powerful flushing action. This feature means that the flushing system is not impacted by the water pressure of the building it sits in. If you live on the upper floors of a high-rise or other building where both space and water pressure are at a premium, this is certainly the toilet for you. Slightly less expensive than the Neorest 770H but a high-end model itself, the Neorest 550 is one of the highest-priced toilets you can buy—and it’s worth every penny. Colors available are cotton white, colonial white, and Sedona beige. One of the cooler features of the toilet is the nightlight built in to keep users from missing the toilet or even falling over it at night. This is a smart toilet that knows when you’re near and opens and closes at will, leaving you with a completely hands-free experience. The hands-free automatic flush is in no way weak and is more than capable of the better power attributes shown by other toilets on this list. There are several modes of cleaning to play with, and since this is a tankless design, you’ll gain a lot more room in your bathroom. To combat bacterial growth, the toilet uses a ceramic glaze that lasts for years without fading. This also reduces the need for chemicals when cleaning the toilet, since it is naturally cleaned. A pleasant surprise is that this product comes with a remote control to handle all actions, so you can either choose to use the automatic functions or manually change them. Another surprise is that the seat has an optional heating function for those cold months. Even the spray position is adjustable! This is the most customizable and advanced toilet on the list, and it comes highly recommended as the best. If the Ultramax 2 doesn’t quite hit home with you, why not try the original Ultramax? The original—considered the best of the series—is still a hot seller and is in the high price range like the updated version. It is available in size 3, elongated, and round. This is the only toilet on the list that is available in size 3, so if that is a priority feature for you then this is the toilet you want. Available colors are cotton white, Sedona beige, colonial white, and bone. Using a 1-piece system, Toto made sure that it was as high-profile as it was elegant in design. Its pretty looks shouldn’t distract you from the fact that it has a commercial-grade flush while remaining quieter than bigger and smaller toilets. With a flush valve of 3 inches, it is wide enough to take down all types of waste without compromising the toilet. This is definitely one toilet that won’t clog up on you, no matter what you throw at it. The trapway is full-glazed and computer-designed so you will get exact measurements rather than having to guess. The rim height for the bowl is great at 14.625 inches and will be more than comfortable for all sizes. At only 89 pounds with dimensions of 28 x 17 x 28 inches, this will be more than enough for adults and children of all sizes. Each flush uses 1.6 gallons of water, and the beautiful material used in its construction is vitreous china. For an alternative to the Ultramax 2, the original is just as good if not better. The ADA-approved, elongated, 1-piece Champion is the first mid-priced toilet on the list, and offers a lot of cool features. Mold, mildew, and other odor and stain-causing bacteria are limited in their growth due to the EverClean surface. That combined with the lack of crevices and extra spaces in a 1-piece toilet means you’ll spend much less time cleaning it. The seat isn’t included, but there are some great alternatives for an elongated piece of this size. It’s made using vitreous china, giving it a wonderful look that lasts for years. The flushing mechanisms are stress-tested and proven to work at full capacity without breaking down, even with repeated use. One of the biggest features is the 10-year warranty that covers everything and is the longest available in the industry. The dimensions of the toilet are 32.1 × 30.5 × 20.9 inches, and it has a weight of 119 pounds. Users won’t have any trouble finding the 4-inch piston action accelerator flush valve and will appreciate the build quality. Its water consumption is a bit on the high side at 4.6 gallons per flush, but it is designed for a powerful flush rather than for efficiency. Buyers wanting a good mix of features with a powerful flush will be happy with this particular model. Staying in the medium price range is this American Standard 2004.014.021 model that is available in white, linen, and bone. The Champion 4 is from a long line of toilets in this series and represents itself as the perfect elongated product for you to purchase. With a 1-piece design and the right curves, there is little to worry about in terms of bacterial growth. An EverClean surface combines with the already great materials of the toilet to create a surface that is very easy to clean. Odor-causing bacteria and stains will be less noticeable and have a lot less power to create other problems. The real selling point of this toilet comes down to the powerful flushing system and the 4-inch piston action accelerator valve. While waste is being pulled down, the bowl gets a full cleaning that leaves nothing behind. Just 1 flush gets rid of the same waste that would cause less powerful toilets issues. A seat isn’t included with this model, but there are some very attractive options to pair with this base toilet. The mechanics and engineering of this product allow it to flush masses 70% larger than the industry standard, making the plunger all but useless. The same amount of power that is used to remove waste is also used to force water back into the toilet. Of all the toilets on the list, this one has the quickest and most powerful flush. With a 12-inch rough in and dimensions of 32 × 29.9 × 21.1 inches, the extra weight from the 117 pounds of this toilet makes it a real beast. The warranty maxes out at 10 years and is limited, so it is a tie for longest on the list. Buyers who want power will be really happy with this purchase from American Standard. 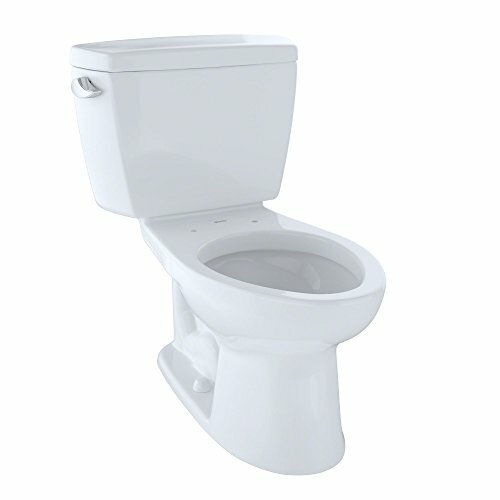 At the mid price range is the Santa Rosa, one of the better and more efficient toilets on the list. As the first Kohler brand on the list, it comes in a range of colors including almond, biscuit, black, dune, white, ice gray, sandbar, and white. Using the 1-piece method, Kohler was able to make a much better design than most toilet makers, and you’ll notice the differences when you’re doing general maintenance. Kohler also introduced what’s known as comfort height-seating, meaning the toilet makes standing up and sitting down easier because of its chair height. This is great for people with bad backs, especially lower-back pain. Even though this is an elongated toilet, it occupies the same amount of space as a rounded model. Design wons like this are the main reason why it is one of the top sellers on the market. An AquaPiston canister forces water to flow into the bowl from all sides, cleaning thoroughly while also pushing waste down. This one-flush system is the envy of the industry, and Kohler is one of the few makers that does it right. The canister design they used for the Santa Rosa has 90% less exposed seal material than 3-inch flapper models, so customers can expect the toilet to be durable and leak-free over the lifespan of the device. The product dimensions are 18.8 × 27.8 × 28.2 with a weight of about 102 pounds, so light and small. The water consumption amounts to an incredible 1.28 gallons per flush, one of the lowest on the list, and all without sacrificing flushing power. Buyers can expect a 1-year limited warranty to cover the product. As one of the better options on the list, Kohler flexes its brand name power with the Santa Rosa. Also on the list is a high-priced 1-piece Toto that comes in a variety of colors. It features a double-cyclone flushing system that is as powerful as it sounds, and is capable of sending waste down in one flush. Available colors are bone, colonial white, cotton white, and Sedona beige. This is probably the prettiest 1-piece toilet on the list due to its skirted design and high-profile tank. The big wow feature of the product has to be the elongated SoftClose seat. Toto spared no design costs when creating this, and the profile is just about perfect for a toilet. Eco Soiree also features a chrome trip lever to give it that little elegant boost, although with the already-premium look, it didn’t even need it. The weight of the product is 120 pounds and the product dimensions are 28.1 x 14 x 27.8 inches with a water consumption of only 1.28 gallons per flush. That’s a pretty amazing achievement considering it is powered by double-cyclone flushing, but it just goes to show how efficient the toilet is with water. A universal height means that both adults and children will be comfortable using it, so don’t be surprised if you end up wanting this in multiple bathrooms. Installation is easy, and the Eco Soiree will probably take the least amount of time to install, considering it has a tank. Although not as popular as some of Toto’s other models, the Eco Soiree has a lot of great pros. Offering a combination of value, efficiency, and comfort, this Niagara 2-piece toilet comes in at the low end of the price scale, using only 0.8 gallons per flush and featuring an elongated front bowl that provides a cozy place to sit, while occupying minimal additional floor space. In addition, the Niagara boasts one of the quietest flushes in the business, beneficial when you don’t want to wake other household members late at night. It uses an air-assisted flushing mechanism that pressurizes the trapway prior to the flush and creates a vacuum-assisted pull when the flush lever is pulled. This powerful combination of air and water creates a system that consistently cleans debris from the bowl with only one flush, and minimizes the amount of water required. This high-tech flush system is, however, concealed by a relatively traditional-looking tank and toilet combination that would be appropriate for many homes. The Niagara is made from white vitreous china and its design is neither ornate nor sleek or ultra-modern. With such a low price and such efficiency, the Niagara toilet can save you money both upfront and in the long run as you save on your water bills year after year. Moving up slightly in price, we come to Kohler’s Memoirs Stately Comfort-Height toilet, which offers increased comfort and efficiency over some of the other models on the list. This Kohler product utilizes a single-flush gravity flush system and a canister that enables water to enter the bowl from all sides to achieve this combination of efficiency and power. The bowl’s fully-glazed vitreous enamel material aids the cleaning process. Many consumers choose the Memoirs model, at least in part for its style. It is available in six colors—white, sandbar, ice gray, black, biscuit, and almond—and it features an architectural design that is reminiscent of crown molding. The unit’s trapway is concealed, which creates a more attractive appearance and allows for easier cleaning. Its architectural style matches other fixtures in the Kohler Memoirs lineup. The Memoirs toilet also features an elongated bowl that makes sitting down more comfortable, as well as chair-height seating that makes getting on and off the seat more comfortable for most adults. Its height also happens to be ADA-approved. A well-rounded option, the Kohler Memoirs model delivers a solid combination of efficiency, cleaning ease, comfort, and style. Next up on the list is this low-priced American Standard model that does away with the idea that you need an expensive toilet in order to have the best experience. Available in both round and elongated shapes, this toilet comes in white, linen, and bone. All colors are sharp in appearance, and with regular maintenance can stay just as shiny as new. Rather than use the contemoprary 1-piece model popular today, American Standard opted for the older 2-piece design, which gives you some room to experiment if you are used to this type. It uses the symphonic dual-flush technology that pushes waste down and keeps it from coming back up. You also don’t have to worry about flushing twice to get everything out as it has a powerful enough wash to keep streaks from appearing. This is a WaterSense-certified high-efficiency toilet that uses as little water as possible for basic operations so that your water bill does not skyrocket. Using modern technology for the actual flushing lever means that it is now a top-mounted push button actuator that is easy to reach for all. The product dimensions are 35 x 35 x 22 inches and the total weight is 92 pounds. It’s important to mention that the seat is not included. Soft type seats are recommended, depending on whether you for an elongated or round type. The flow rate is 1.6 GPM and the toilet comes with a 2-year limited warranty. In terms of ease, affordability, water usage, and efficiency, this is easily one of the best. From one of the trusted names in the industry, the Kohler K-3978 Wellworth delivers solid value without sacrificing performance. Coming in a bit high on water usage compared to some other toilets on the list at 1.6 gallons per flush, you can question this unit’s efficiency, but performance is its strong point. The flushing system delivers water at high pressure, at once clearing bulk waste and cleaning the bowl. The fully glazed trapway and bowl aid in the cleaning process by preventing debris from sticking. The Wellworth is a 2-piece toilet consisting of tank and bowl. Its design is on the traditional side, although it does feature some unique sculpting and shape in the tank and has an elongated bowl, which many people find more comfortable than round bowls. The height of the bowl is somewhat lower than other models at 14 ½ inches (368 mm), which makes it non-ADA compliant; however, you may find this height more comfortable. While this is a relatively basic model, it makes up in flushing power what it lacks in high-tech features. If you’re looking for a powerful flush at a low cost, this is the toilet for you. As we move into the higher-priced compact toilets, we find Toto’s G500. Here you will begin to see high-end features like a skirted, 1-piece design and Toto’s patented CeFiONtect technology—a glaze applied to the surface of the bowl—that prevents waste from adhering to it, helping it stay cleaner longer. This is a highly efficient unit using only between 0.9 and 1.28 gallons or 3.4 and 4.8 liters of water per flush, depending on how you set it. The power of the water is boosted by three jets. A very compact unit, the G500 occupies 11 5/8 inches (295 mm) by 21 7/16 inches (545 mm) of floor space and requires a 12-inch (305 mm) rough in. From the elongated front bowl, which adds comfort while taking up minimal space, right on to the heated seat with temperature control, the comfort offered by the G500 is not to be overlooked. The remote control adjusts the temperature of the seat as well as the temperature and pressure of the washlet, and it offers 2-user memory. You’ll also find an automatic open/close seat that opens as you approach the toilet and closes (and flushes) when you get up. In this instance, round toilet seats are seen as outdated while elongated toilet seats are the fresh model on the market. This is pretty much true, but round seats are not at all on their way to being discontinued, in fact, as many round seats as elongated seats are made each day. So which is better between the two, or to put it better, which is the best option for your home? If your top priority is an ADA-compliant seat, either for personal use or for visitors to your home that require it, then without question an elongated seat is preferable. ADA-compliant elongated toilet seats are five times bigger than their round counterparts; and even if you opt for a round seat, it won’t be as comfortable as an elongated one in the same series. The ADA standard was created in 2010, so a lot of the designs that were compliant were made around the time that elongated seats just began to take off. Once again, there are round toilets that fit the bill, but it goes without saying that a large seat is always going to be more comfortable than a small one. Now, one positive of round seats is that they are typically 3–6 inches smaller than a standard elongated seat. This may not seem like much, but in a small bathroom this can make all the difference in the world. They might also be preferable for bathrooms with children just finishing potty training. Going from potty training to elongated seats can be a big leap, so the more natural option is to go to a round seat. RVs typically have round seats due to space concerns, and even the biggest bathrooms can benefit from having a few extra inches if they are designed badly in the first place. For example, some bathrooms have the tub very close to the toilet, meaning that a larger toilet will have your leg brushing the side of the tub when you sit down. Not only is this uncomfortable, but it can cause bruises if you sit down for an extended amount of time. Putting in an elongated toilet in that situation would cause leg cramping and some of the most uncomfortable sitting possible for a toilet. It’s all about an extra inch here and there, and allocating space appropriately. No two bathrooms are the same, so it is safe to say that there is no ‘better’ universal option. However, if the space and environment permit and there isn’t a big space difference between installing an elongated toilet and a round one, then the most comfortable bet will always be the elongated toilet. This also applies to the elderly, and people who specifically fall under ADA guidelines and need that type of toilet. However, in an apples-to-apples comparison without factoring in the environment, you can go either way with your toilet seats. There are fewer choices now for round seats, but that doesn’t mean that they don’t still have a lot to offer. If you do enough research you will find great round toilets not only on this list, but everywhere. There are just fewer than there used to be for the general public. So you’ll be hard pressed to find a round toilet in any public bathroom, much less in a work environment; so get used to elongated toilets if you haven’t already. Not only are they here to stay, but in the future it may be even harder to get hold of a round toilet for your residential use. The question is, will this transition happen before tankless toilets have been sufficiently innovated. If you are still looking for something different from what we have on this list you can visit our toilet guide to learn more about different options, features, and toilet types. One of the most surprising facts about toilet water usage is that it accounts for most of the 80–100 gallons of water you’ll use in a day. Not the shower, not the kitchen, but the toilet. It uses the most water, which is why over the years standards have gone up so that the average number of gallons per flush is 1.6. Before that, you were looking at up to 4 gallons per flush, an incredible waste in more than one way. Even if your toilet is newer but it was manufactured before the new standards went into effect, you’d be looking at about 3 gallons per flush. These are huge numbers not just for one person, but for multiple people. They add up over the months, and by the end of the year you would have paid hundreds extra on your water bill. Newer toilets have a lot more to offer than toilets that are only 3–4 years old, so don’t overlook some of the better features being offered in flushing technology. So how much better are the toilets that offer 1 gallon per flush? A lot better when it comes to saving water, but that doesn’t automatically make them the greatest toilets on the list. A couple of the products available use complex technology that only requires 1 gallon per flush. Usually this would result in double flushing or streaks and stains being left in the bowl because not enough water went through. To compensate for the remaining 0.6 gallons, the manufacturers designed the spouts on the inside of the bowl to be positioned a certain way so that it gets the most coverage when cleaning. Water and waste are also pulled down with the help of gravity, so reducing by 0.6 gallons is still efficient. That being said, in a head-to-head comparison for flushing a toilet, one that uses 1.6 GPF will always beat a toilet that uses 1 GPF. Even with innovative design and engineering, the 1 GPF toilets can only make up for what they are missing while the 1.6 GPF is already there to begin with. Not even counting variables like type or amount of waste, in an extreme situation, double flushing is more likely in a 1 GPF toilet. There is a middle-ground option of 1.28 gallons per flush, if you want to play it safe. That gives you the perfect balance of power and water saving, all in one package. With up to one third of all household water usage going to toilets, users with multiple bathrooms may definitely want to take a closer look at their toilets. RV users will also find more use for 1-gallon per flush toilets than heavier use ones, since it will be their primary toilet. The only problem with that is the limited space in RV bathrooms, and also the customization issues that prevent a tank model toilet from being installed. The few tankless models on this list will work just fine, but finding one that is as good on flushing as a 1-GPF tank model will be hard. When looking for a toilet that is good on water, prioritize whether or not it will make a big difference to shoot for the major savings or the major cost. One-Piece Toilet or Two-Piece Toilet? When deciding between a 1-piece and a 2-piece toilet, there are a couple of things that are easy to overlook. The Big takeaway is that the 2-piece toilet has been around for a long time and is more trusted than this new 1-piece model. The 1-piece model is really no different from the 2-piece though—it’s just an all-in-one unit. This is no different to a TV/DVD combo, or for better reference, a bidet/toilet combo (you can check our toilet accessories guide for more info). Of course, the one thing customers will bring up is that with a 1-piece toilet, if one part of it malfunctions then the entire toilet is kaput. This is actually the same argument to be made for a 2-piece, because if the tank or the bowl in a 2-piece gives you problems, guess what? You won’t be able to use it any more than you would be able to use a malfunctioning 1-piece. This and many other misconceptions about the two models have caused somewhat of a split down the middle when it comes to sales. One-piece toilets are smaller in size compared to 2-piece ones. So if you’re not ready to adopt the tankless model but want some similar space-saving features, then you definitely want to settle for a 1-piece. Some of these models sit lower to the ground, but there are a lot of 1-piece toilets that sit at seat height in order to offer a more comfortable experience. Pay attention to the seat height so that you know whether or not it will be more comfortable for an elderly person, an adult, or a child. Did you ever have to clean a 2-piece toilet and there were areas you just couldn’t get to so they kept getting dirtier? Those nooks and crannies are gone with a 1-piece system. You’re now free to clean however you like without worrying about buildup due to places being out of reach. With fewer places for bacteria to grow and collect, there will also be less odor and germs in and around your toilet. If you are a serious cleaner and tend to go that extra mile when cleaning the toilet, then getting down and around the edges is easier, since it’ll be lower to the ground. Not enough customers talk about how durable their 1-piece toilets are, which is why even those that come with 1-year warranties are great deals. With fewer of the important elements of the toilet exposed, the most vital parts of the product are protected from damage and will last for years based on the original build. Some of the biggest damage that can occur is due to outside moisture, which will have few ways of gaining traction with a 1-piece toilet. With the least amount of parts to be compromised with its closed-off build, a 1-piece toilet not only validates a 1-year warranty but it leaves the 2-piece model in the dust. Now, the only place where a 2-piece toilet will always win is in price. It costs considerably less to build a toilet in two separate pieces than all in one. This benefit also comes from the various tests you can run on the 2-piece systems that may be inaccessible to a 1-piece. The lowest price is always going to be on an older model, so if you’re looking to save some money then checking out the 2-piece products on this list will be a good start. Even with modern toilets increasing in power, the older models are still claiming a big part of the market share due to customers not moving on quite yet. If you’re the type of buyer that has a bit of trouble making up your mind when making a purchase, don’t feel bad at all, you’re not alone. Here’s our guide to toilet prices for those who are not sure how much to pay for a toilet. As a side note, 1-piece toilets have the added benefit of coming in one box when shipped. Complications from dealing with a 2-piece toilet can cause one part to be shipped one week and another to come a week after that. This can be a frustrating experience if you need the product fast. If you had to take a day off from work in order to install the toilet, not knowing when the full unit will arrive can really put a spanner in the works. In favor of 1-piece toilets, you can expect them to not only arrive fast, but with everything you need right out of the box. Which Is The Best Toilet Brand? On this list the best toilet brands available are Kohler, Toto, Saniflo and American Standard. The list is heavily influenced by Toto and American Standard, with the former getting the nod for best toilet on the list. Saniflo is the least mentioned but also has a top 5 toilet on the list, so that is saying a lot about the company and how innovative their toilet is. You really can’t go wrong with any of the brands, but if you had to choose one, which one comes out looking best? For innovation, go with Toto. This brand has a way of knowing when to push the envelope in the industry, which is why the Neorest is the best toilet on the list. There were a lot of features with this toilet that came off as silly gimmicks when it first came out, but soon became some of the most sought-after features for a luxury toilet. Toto is also great for improving upon its established models, which is why its series of toilets show remarkable improvement the higher up you go in the line. Even with that improvement, there is heavy favoritism for the original/debut models. Toto creates toilets so great that even after it improves on the line, people still play favorites with the older models. That is a testament to brand satisfaction and Toto’s customer loyalty. For brand recognition, go with Kohler. It is the most well-known maker on this list, and if something ever goes wrong with the product, then the best warranty (despite length) is going to come from Kohler. It has a lightning-fast customer service department and the most compatible toilets, no matter the installation guidelines. This means that if you run into an issue where A doesn’t work with B then you can simply call them up or go to the store to resolve it on your own with little to no problems. Kohler has the most painless installation instructions and the clearest and most concise manuals of any product on this list. With so many locations across the world it is also the fastest to ship, so keep that in mind if you’re looking for rush delivery. This is one of the few times where brand recognition really does go a long way. Saniflo, much like Toto, is great at innovation, and offers a lot of luxury items at a better price than its competitors. A good example of this is the Sanicompact that is a direct competitor to Toto’s Neorest. Now the Neorest easily wins the head-to-head matchup, but the Sanicompact is still one of the top 5 products on the list. That is an incredible accomplishment, and it is the only product on the list that is in the same league as the Neorest. Saniflo does the same with its other line of toilets, filling them with great features but being careful not to price them too high. It doesn’t have the name recognition of Kohler or Toto but it still does an incredible job of making sure that its products contain as many features as possible without being too outside consumers’ budgets. This is a slippery slope in marketing that Saniflo has done a good job of skating. It’ll be interesting to see if it can keep up with the likes of Toto without fading into the background. Read our full Saniflo toilet guide here. American Standard is a jack-of-all trades company that produces some of the finest toilets on the list. The company is more old-school and less likely to take risks like Saniflo and Toto, as evidenced by its products on this list. Despite its old-school approach, it still has the greatest varied lineup of any competitor on the list, which is why it is so highly regarded by customers. American Standard should be considered the most balanced company available, although Toto is not far behind. But the best mix of new age features with old school features can be found in an American Standard toilet. A lot of people are actually rocking this brand in their homes and don’t even realize it. Since the company is pretty good with pricing, its models are extremely attractive to customers who want to purchase more than one product. That’s a good roundup of the companies on the list, and hopefully a good reference for you to know what company offers you the best value. This may seem like a stupid question since the answer is obviously going to be yes. What you may be overlooking though is that a number of companies offer a 1-year limited warranty, and the next warranty length available is a huge jump of 10 years. This is a big jump, and it may be hard for the consumer to come to terms with a good deal if the warranty is 1-year limited for one of the most heavily used appliances in the household. There really are no blurred lines in this situation since one of the bigger brand names like Kohler offer a 1-year limited warranty, while generic and less-known names can sometimes offer a 10-year warranty. It is a big contrast that may make some customers think that a company doesn’t adequately stand behind its product unless they offer a long warranty. There is a little wiggle room in that ideology, and that’s because there are options to extend that warranty, depending on the company. A good example of this is in electronics where both Dell and Apple offer 1-year limited warranties, yet also offer extensions of up to 3 years. Many of these extension offers are unlimited, meaning that you can extend it as much as you feel like. Customers shouldn’t feel as though they can’t trust the company just because they offer a 1-year warranty, especially when that warranty can be extended. Although not on this list, there are toilets that offer 20–30 year warranties, yet if you read the negative reviews, it is clear that these warranties are nothing but paper. Dissatisfied customers return the faulty product in droves, only to be given the runaround from the company. You won’t get any runaround from the companies on this list, and all of the reviewed products are 100% quality. Then when you get down to the warranty, no matter the length, you’ll get a customer service representative who wants to help you rather than lead you in circles. Trust in the brand and the product rather than the warranty, as the first two should be more than enough to let you know what you’re buying into. If something does go wrong, you’ll be well taken care of, thanks to this list and the trusted brands. There are a lot of customization options for consumers that want to go the tankless route. Besides saving several inches of space, these are the only models that are equipped for both the home and an RV. All you need to hook them up is some time, an outlet, and access to plumbing. They can be installed against the wall or you can run the water pipes underneath the toilet. Some extreme designs feature the toilet in the middle of the bathroom surrounded by a moat. This obviously isn’t going to be everyone’s taste, but it sure does show how creative you can be with a tankless toilet. You can also read different bathroom blogs that can help you design you bathroom decor so it matches. Having the toilet, bathroom faucet, tiles, and the shower head all match can make a big difference to your bathroom. There is also room for a bidet of your choice, and not just the type that hooks up to the toilet. With connection systems that allow you to connect a sink to the toilet, the options are endless and the only other hurdle is time and money. The only drawback to one of these systems is that it needs to be plugged in if the power goes out completely. If you don’t have a generator, then there will be some obvious problems using the advanced features of the toilet. Tankless designs also have the most breathtaking designs and curves of all toilets in the industry. If you want to make a statement then you won’t use a 2-piece or even a 1-piece toilet, the tankless design is awe-inspiring at every glance. Moving on to the cons of a tankless system, they are mostly going to revolve around price. Tankless toilets are the most expensive in the industry, and if this list is any indicator, there are not as many of them in production as the rest. The good news is that there are less low-quality models flooding the market, meaning that if you purchase a tankless model, chances are it is legit and worth your money. Since there isn’t a lot of competition coming through for these models just yet, expect products from Toto and Saniflo to dominate the tankless market. If you’re used to fixing things yourself when they go wrong, bear in mind that fixing a tankless system is not like fixing a regular toilet. There are different steps to take and it will take some time before most users feel as confident fixing this system as they do regular toilets. Although with time it can definitely be as easy, it isn’t something that will be learned overnight. There are many helpful videos online about installation and fixing that will come in handy when dealing with this design. The best thing to do in the beginning while it is still under warranty is to take advantage of that rather than taking chances. Considering the massive volume of water that toilets used back in the day, things have calmed down a bit as the industry standard is now 1.6 gallons per flush. All of that time and effort meant that other parts of the toilet experience were neglected, which is why 1-piece toilets are just now starting to gain some interesting market share. The toilet industry has really exploded with ideas and you can see it in products like the Neorest. The Neorest is the crowning achievement of a long list of top-rated toilets. The Sanicompact’s sales are increasing — and a sign of things to come if customers adopt the new technology. For the time being, 1-piece toilets are still trying to dominate the market and make the 2-piece model extinct. Since 1-piece toilets are overwhelmingly superior to 2-pieces, the only thing stopping them from overtaking the market is price. Once the price evens out, you can expect 1-piece toilets to dominate the market. The market is changing and it’s looking good for customers that are ready to upgrade. When prices are at an all-time low it’s time to get off the fence. Several companies have already put their best products forward, so you definitely have a lot of choice. If you are still undecided, you can read our toilet reviews, which should help you pick out the best toilet for your needs. Sticking with a familiar brand is ok, as long as you do your homework. There is no hiding the fact that the best product on the list is the Neorest, but it may not be for everyone. No matter what you end up with, as long as it’s from this list, it will be considered a world-class toilet.